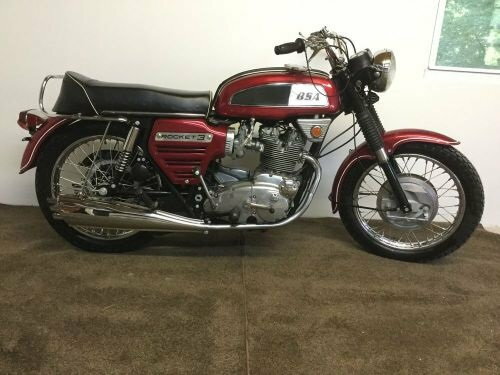 For sale: 1969 BSA ROCKET 3 PURCHASED FROM THE SECOND OWNER AND IN VERY NICE CONDITION WITH 6233 ORIGINAL MILES. THE BIKE WAS GIVEN NEW TIRES, PAINT ON GAS TANK AND SIDE COVERS WITH HAND PIN STRIPING, NEW AMAL 626 CARBS, HEADLIGHT SHELL AND A SUPER TUNE AND SERVICE. EVERYTHING ELSE IS PRETTY MUCH HOW IT CAME FROM THE FACTORY. BEST PART IS NO MONKEYS HAVE BEEN INTO THE MOTOR TO MESS IT UP THEN PUT IT BACK TOGETHER AND CALL IT RESTORED. THIS IS A VERY PRESENTABLE BIKE TO RIDE OR SHOW. THE ONLY REAL NEGATIVE IS THE FRONT WHEEL HAS A 2 - 3" LONG SPOT WHERE THE CHROME HAS BEEN COMPROMISED WHERE CONDENSATION SETTELED WHILE SITTING. THE REST OF THE CHROME WHEN LOOKING VERY CLOSE HAS TINY PITTING BUT IS STILL VERY GOOD. THIS BIKE HAS BEEN SERVICED, RIDDEN THEN DRAINED OF GAS AND BATTERY REMOVED AND WILL BE SHIPPED IN THAT CONDITION.